A beautiful aerial view of a raging river meandering its way through the Mealy Mountains wilderness in Southern Labrador in Newfoundland Labrador. This river has made a deep impression in the Mealy Mountains in Southern Labrador as it quickly flows through the vast wilderness. A few waterfalls cascade down the mountain slopes and flow into this river surrounded by massive rock formations covered in lush greenery. Aerial view of a river cutting through the wilderness of the Mealy Mountains in Southern Labrador, Labrador, Newfoundland Labrador, Canada. 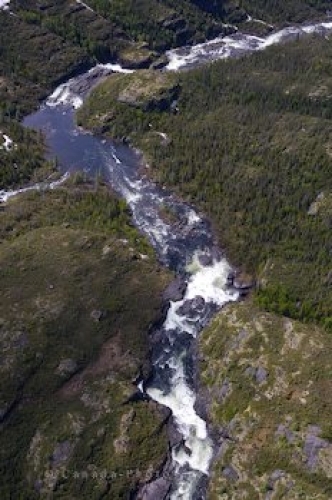 Aerial view of a rushing river through the Mealy Mountains in Southern Labrador.